(February 5, 2019) - In January 2019, Verdant released its annual Agribusiness M&A and Investment Review which featured summaries of observations and expectations for key trends in our sector. Over the course of the next several weeks, we will provide full reports on several of those summarized topics. This report describes the consolidation drivers, trends, and future expectations for the digital and precision agriculture market. The last few years, agriculture has been dominated by headlines of mergers and acquisitions by and between some of the largest agricultural companies in the world. Depressed commodity prices, demand for innovation, increasing regulation, and growing costs to develop new products has driven unprecedented consolidation. Amidst efforts by the most storied and established agriculture companies to synergize and gain efficiencies, an eruption of next generation technological companies has emerged with intent to transform “modern” agriculture. Recognizing the demand for technological improvements, especially from the consolidating group of large and sophisticated farming enterprises, and an inability to develop novel offerings internally at the same pace as startups, strategic agribusinesses have initiated the beginning surge of M&A in the Ag Technology market. Acquisition demand from major agribusinesses, coupled with pressure from financial investors placed on startups to make returns, has launched a wave of consolidation that has the potential to be the next disruptive transformation following the megamergers that have overshadowed agriculture headlines since 2015. In 2013, Monsanto turned attention to the agriculture technology sector when it acquired Climate Corporation for approximately $1.0 billion. An already growing segment became inundated with opportunistic angel, venture capital, private equity, and other financial investors seeking similar valuation premiums. Seeing a pool of available capital, eager entrepreneurs entered the space with innovative ideas and solutions intended to improve decision-making, efficiency, and profitability for suppliers, producers, processors, and others in the agriculture value chain. The dynamic has resulted in an overcrowded field of startups that are largely supported by financial investors. As the market has matured and a few proven and/or distressed digital solutions have been acquired, financial investors have become impatient and started placing pressure on startups to explore M&A as a solution to generate returns. The initial entrants to the tech market are now at series B to C fundraising stages, and, without ample time to implement business models and generate cash flows, are faced with limited options outside of seeking further capital or divesting. Mergers and acquisitions in Ag Technology have begun, but the marketplace situation indicates that they are far from finished. One of the most active sub categories in Ag Technology, in terms of invested dollars and acquisitions, is “FarmTech” – companies and technologies focused on the improvement of total producer productivity through biotechnology and digital breeding, digital farm management, and mechanization and equipment. 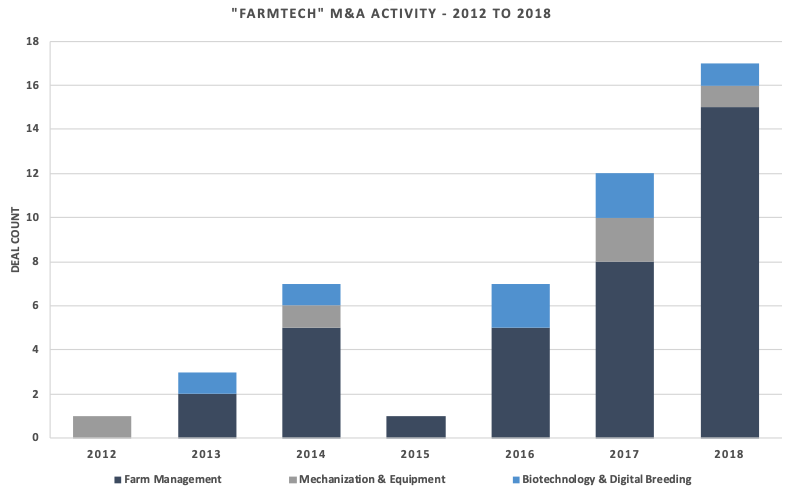 Over $2.5 billion was invested into FarmTech during 2017, and approximately 30 acquisitions were made during 2017 and 2018. FarmTech is unique from other Ag Technology verticals in that it remains unclear who will bring the products to the consumer and maintain the service relationship. Currently, all participants across the value chain are participating in the sector, including genetics suppliers, branded marketers, retailers, equipment manufacturers, grain processors, and beyond. Each of these groups is working to develop or acquire components for a full-service solution to improve producer profitability and efficiency. The approach also supplements existing product offerings made to the consumer by these agribusinesses. The chart below shows the consolidation events in FarmTech from 2012 to December 2018. Over 50% of the acquisitions made during this period were by strategic agribusinesses. The remainder of acquisitions were by and between technology platforms looking to bolster offerings to create a more attractive package for marketing or eventual acquisition. What’s Next in the Market? As of December 2018, farm commodity prices continue to be dismal, especially for Midwest row crop producers. Faced with shrinking budgets, an already conservative group will be more selective when trialing and/or purchasing digital solutions that cannot demonstrate near-term financial returns. FarmTech platforms facing slow adoption rates and negative profitability will continue to rely on financial investors to cash flow the development of the business. As investor patience wanes while concepts are proven, technology providers will look to longer-term investment or divestment opportunities. Understanding the demand for improvements across the agricultural supply channel via demonstrated technologies, strategic agribusinesses with existing relationships and broad distribution capabilities will compete to be the best provider of those technology solutions. With a slower pace for innovation, strategic agribusinesses will look to acquisition as a means to establish and bolster existing platforms. From niche crop digital breeding technologies to blockchain solutions, the Ag Technology market is poised for disruption. New leaders in agriculture may be created, and existing participants will invest in innovation to remain competitive. The agricultural market is everchanging and improving, and all signs suggest Ag Technology will continue to be at the forefront of minds working to feed to world. 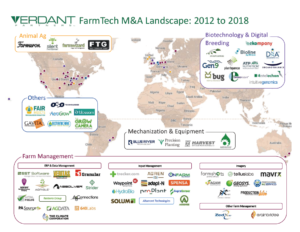 See the current FarmTech M&A map above and watch for news about transactions involving Ag Technology; it is sure to come.